Over the years the banking, finance and insurance has substantially evolved. Has also changed the behavior that these institutions have been taking over the ages. The multimedia kiosks now become an indispensable tool in this sector. Usualy, the communication of such institutions is made through informative brochures or posters, which banks, financial institutions and insurance still use today, and probably continue to use in the future. However, in the era of digital multimedia kiosks an interactive tool at users service provides a greater motivation to "purchase" of products. Also, these institutions provide services that are, and will naturally continue to be, done by people because the human element is vital in this sector. 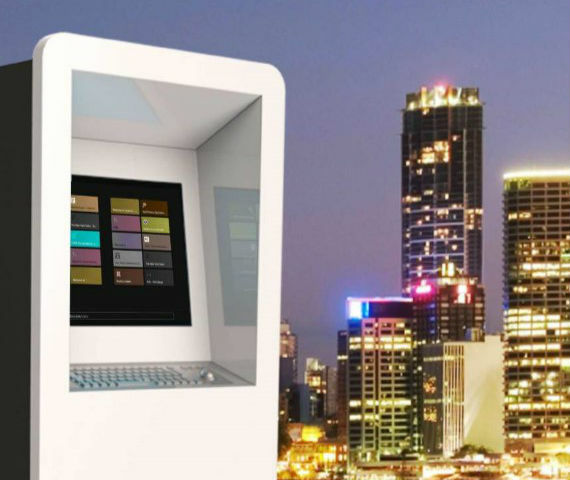 But today is common to see a multimedia kiosk at a bank, financial or insurance, not only by the modernity that gives to the space but mainly because there are tasks where the multimedia kiosk can replace a human presence. In the case of insurance (which now appear to be associated often the banks) a multimedia kiosk is used to perform simulations and other simple tasks that everybody can do. Just as happened with the ATM, which, many years ago was a "foreign element", we are certain that the institutions in this sector look at the multimedia kiosk as a "working tool" more effective, useful and necessary. • Way to promote banking products, financial or insurance - Interactive interface for the calculation of the several products these institutions have to offer. • Conference Call for the Call Center Service of the institutions. • Products Presentation promotional, tax calculation, etc..
• Advertising and digital advertising.